I usually pack sandwiches as breakfast for my husband and even for my kid to school. So making it a bit healthier is a must !!! this is one of the sandwich variety which I usually send them. 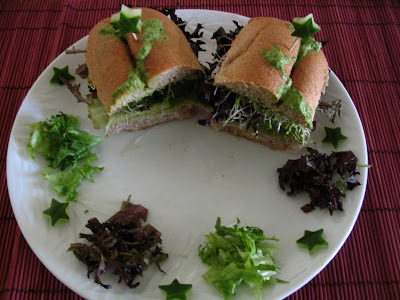 Alfalfa sprouts, lettuce cucumber are main stuffing's that I use for this sandwich along with pesto. Alfalfa is really a member of the pea family. It has good amount of nutrients such as calcium, folic, magnesium, manganese, phosphorus, potassium, silicon, sodium, zinc. This is the only plant which supplies whole range of vitamins. Top source of anti - oxidant. Greatly helps in boosting your immune function. Grind everything to coarse paste and store in the refrigerator. For me it comes to one week. 1. Slice the bread in the middle or if it is sliced bread apply the pesto in the inner portion of the slices. 2. Keep the cucumber slices, lettuce, alfalfa sprouts, olives. 3. Wrap it with foil or cling wrap it. I Hope I have time to make all these great recipes da.very very mouthwatering. Pesto sandwich is a grt option for tiffin! yum yum! That's a very healthy and delicious Sandwich. Perfect for lunch time. simple healthy and delicious!this is a real treat! Wow... healthy sandwich.love the presentation. Yummy and healthy sandwhiches Pavi! Never made pesto at home!! Thats totally healthy..ooh i love to have one..Pesto..mmm..great ! 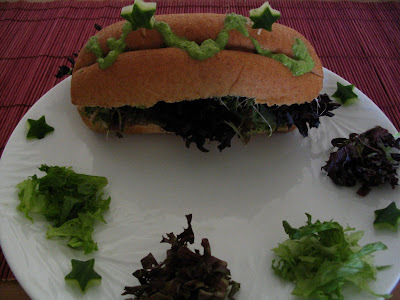 Even I do pesto sandwiches dear...Love the taSTE OF PESTO IN SANDWICH..But we dont get those sprouts here..
Loos so yummy. Healthy too. That is one huge healthy sandwich Pavithra.Laajawaab!!! Wow! Very interesting and very healthy.Will try it for my kids.Thanks for visiting my blog .I am visiting u again surely. Thats a healthy breakfast sandwich..looks fresh and tasty.. 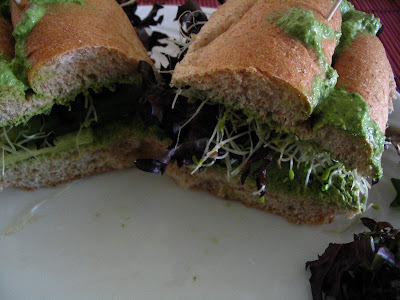 I love Pesto too.. makes everything brigh and delicious - that's a healthy sandwich no doubt. Thanks everyone for your lovely encouraging comments.. I just bought a bottle of pesto and practically looking for anything to apply it on :-D, lovely sandwich! A perfect sandwich to me...love your presentation. This a very healthy sandwich;nice idea and thanks for sharing. I love alfalfa sprouts and I love your blog. awesome recipe..itsso gud to pack for lunch boxes right? lemme try this sometime.